Search Results for: "Plenty of resources"
Kelly Ruppel grew up on a dairy farm outside Racine, headed to the west coast for college and worked in Washington D.C. before moving back to the Midwest and becoming a private consultant to the embattled Chicago Public Schools system. When she received a job offer from new Madison Schools Superintendent Jennifer Cheatham, whom she met when Cheatham was a top administrator at Chicago Public Schools, she and her husband packed their bags. Today Ruppel is Cheatham’s chief of staff, one of five top administrators hired by Cheatham with ties to Chicago since taking the reins of the Madison School District in April. Jessica Hankey, director of strategic partnerships and innovation, formerly manager of school partnerships at The Field Museum in Chicago. Fascinating. Are these new positions, or are the entrants replacing others? 10/2013 Madison School District organization chart (PDF). 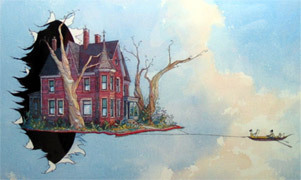 The median household income in July was $52,113, according to a report by Sentier Research. That’s 6.2 percent lower than the median in September 2008, the start of the financial crisis. And there hasn’t been much growth since 2011. That jibes with Saez’s research, which notes that incomes of the bottom 99 percent have fallen 12 percent in the recession and have grown just 0.4 percent in the recovery. Related: Madison Schools’ 2013-2014 budget includes a 4.5% property tax increase after 9% two years ago. “Plenty of resources” and “the Madison School District has the resources to close the achievement gap“. Madison Superintendent Jennifer Cheatham recently cited the Boston and Long Beach Schools for “narrowing their achievement gap” during a July, 2013 “What Will be Different This Time” presentation to the Madison Rotary Club. As time permits, I intend to post comparisons between the Districts, starting today. 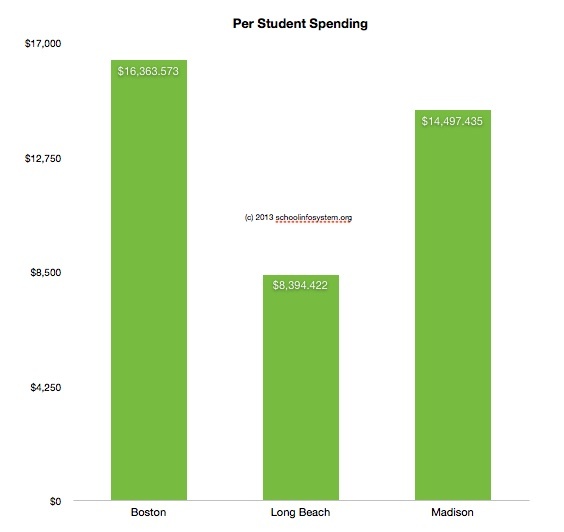 Boston Schools’ budget information was, by far the easiest to find. Total spending is mentioned prominently, rather than buried in a mountain of numbers. Finally, after I noticed that Madison’s student / teacher ratio is significantly lower than Boston, Long Beach and the Badger state average, I took a look at the Wisconsin DPI website to see how staffing has changed over the past few years. Madison’s licensed staff grew from 2,273 in 2007-2008 to 2,492 in 2011-2012. 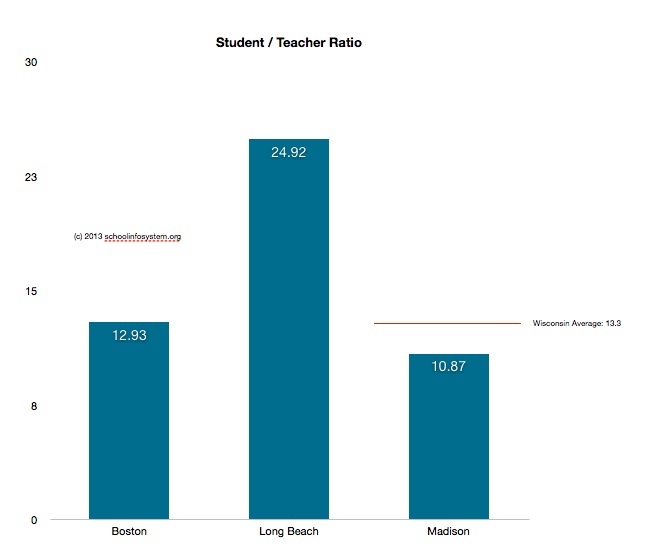 What are the student achievement benefits of Madison’s very low ratio?